Product prices and availability are accurate as of 2019-04-03 07:32:39 EDT and are subject to change. Any price and availability information displayed on http://www.amazon.com/ at the time of purchase will apply to the purchase of this product. 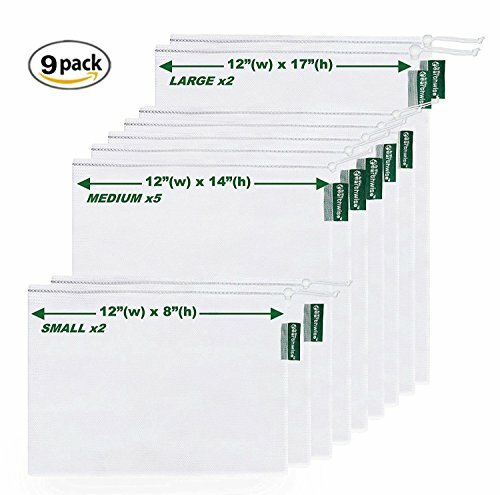 These multi-purpose bags are great for grocery shopping, storing and transporting produce, small toy storage, cosmetics , toiletries , travel, shoes, laundry and many other items. These high quality bags are made of premium polyester mesh that is strong but lightweight and machine washable. They are BPA Free, and tested to make sure the fabric content contains no heavy metals. Easy to keep closed with our instant-close drawstring bead. Foldable and easy store in a small drawer. With Multiple sizes ( small, medium, and large), you can fit any size fruit or vegetable or other items, from small veggies to extra large fruits. Great for storage and organization of small items including toys, snacks, crafts, collectibles and much more! 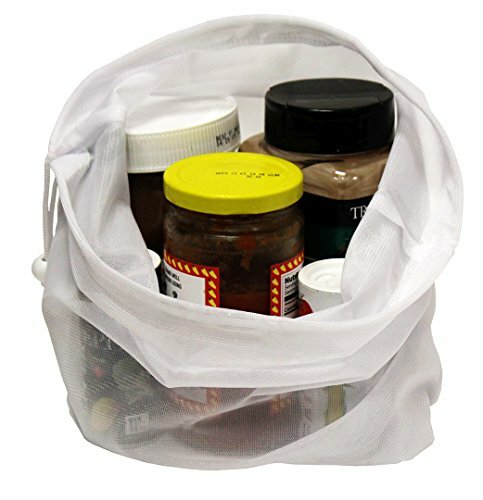 DISTINCTIVE, SAFE AND EFFECTIVE -Our Premium Reusable Mesh Produce Bags can SAFELY hold all your fresh produce, as they are BPA Free. Our products are tested and evaluated for toxicity and safety and comply with applicable quality and safety regulations. Food contact safe! 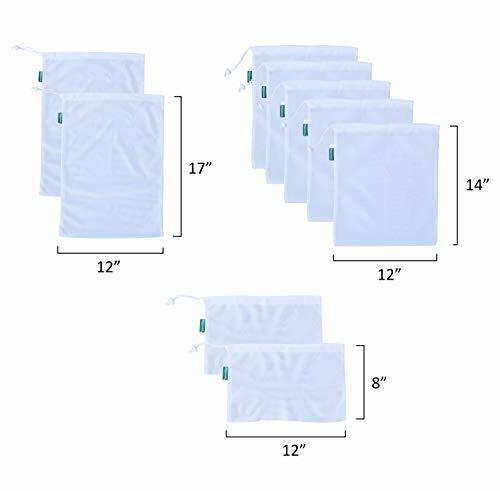 VARIETY OF SIZES = VARIETY OF FOODS: With the Earthwise Premium Reusable Mesh Assorted Bag set, you will find an unlimited number of ways to use them since this fantastic set includes a total of 9 mesh bags in one pack - and in 3 great sizes. 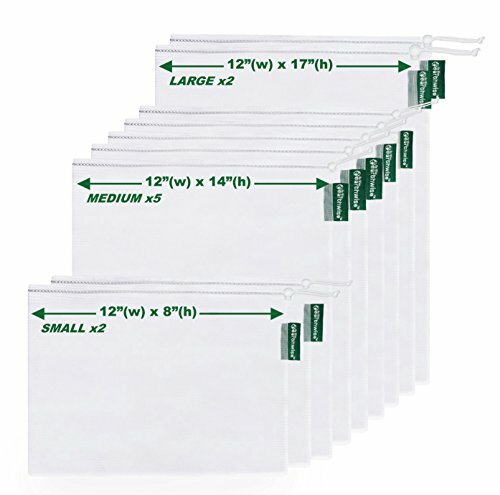 Bag sizes are LARGE -12x17in, Medium - 12x14in, Small - 12x8in MULTI-PURPOSE: With so many different sizes, our premium bags are not just for produce. You will be amazed at how many ways you will use these incredible bags - from all sorts of household items to your children's small toys, to crafts. From office supplies to small sports equipment or your gym clothes, beach trips, camping trips, picnics...they are ideal for essentially any form of organizing you can think of. CARE-FREE CARE: Our mesh bags are machine washable, and again, our bags are free from harmful manufacturing chemicals, meet all toxicity and safety regulations and are absolutely food contact safe! Earthwise Premium Mesh Produce Bags are made with the highest standards of quality control. TIME SAVING FEATURES - wash your produce directly in the bags and then place them straight into the fridge. 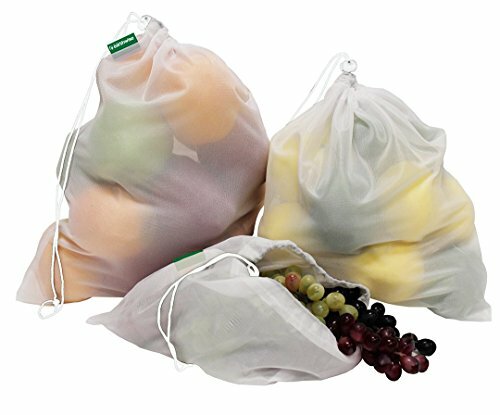 More savings, less food wasted and great for the environment - eliminating the need for traditional, plastic produce bags.